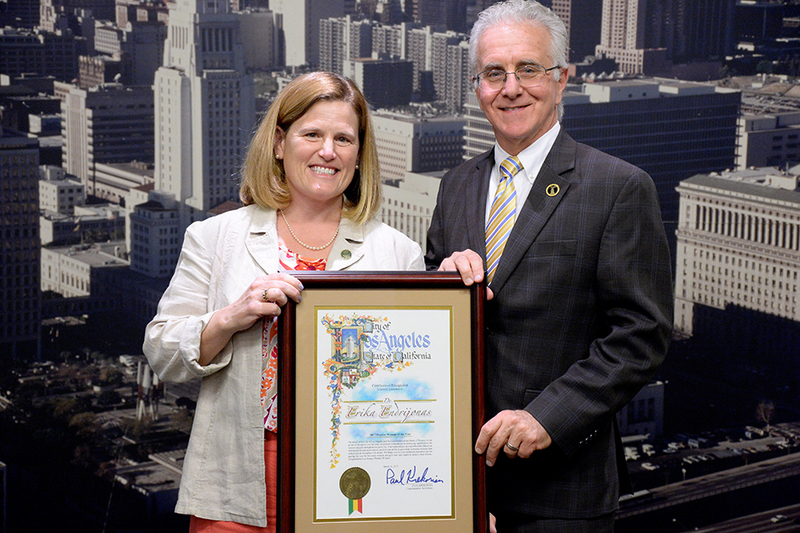 Endrijonas was honored as the 2017 Pioneer Woman of the Year by Los Angeles City Councilmember Paul Krekorian (Council District 2) on March 31. Professor John Broesamle handed then journalism major Erika Endrijonas ’88 (History) the results of an exam she had taken in his history course at California State University, Northridge. Endrijonas was a little confused, but visited the professor after class in his office. “Please say you’re a history major,” Broesamle said to her, so impressed by her work. “I’m going to change that,” he said. The meeting in the mid-1980s between the two changed Endrijonas’ academic direction. She switched majors to history and later became Broesamle’s teaching assistant, and worked at the Delmar T. Oviatt Library. Taking on multiple jobs at CSUN gave her the opportunity to work closely with faculty and staff to see and understand their wants and needs. Using her experience and knowledge from working at the university was a significant launching point for Endrijonas to land where she is today — the president of Los Angeles Valley College (LAVC). Since taking the helm in 2014, Endrijonas has become a transformative figure for LAVC by turning around its fortunes during a tumultuous time. Being president of LAVC has helped shape her into a phenomenal leader whose impact spreads beyond the college. Endrijonas is openly lesbian and a founding member of the national organization LGBTQ Presidents in Higher Education. She also teaches part-time in the CSUN Ed.D. program in Community College Administration. Endrijonas pointed to her fateful meeting with Broesamle at CSUN as a major turning point in her life. “It would have been a completely different path, because he really was that person [to change my direction] for me,” Endrijonas said of Broesamle. Broesamle retired from CSUN in 2000. He recently sifted through some old class rosters. Some of the names had slipped from his memory, but others are embedded in his mind — the names of the special students. When he reads the name Erika Endrijonas, his memories of her as a history student are crystal clear. Broesamle also recalled making the note on her exam, summoning Endrijonas to his office — a rarity. Endrijonas, after switching majors to history, was on the path to a career in teaching. She altered her life direction once again when she reflected on her undergraduate and work experience at CSUN. 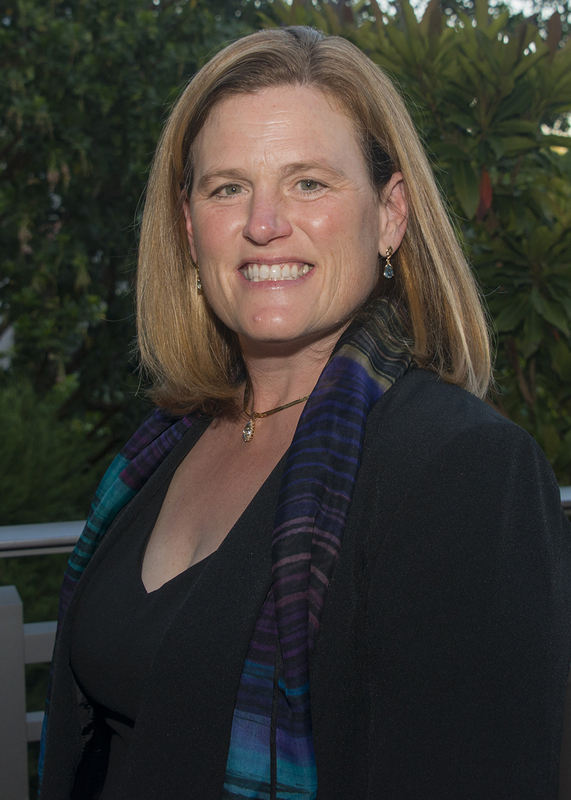 She went on to graduate school at the University of Southern California, which in turn helped her discover a passion for higher education administration. She became an academic advisor at USC in 1992. Afterward, she took a job with Granite State College in New Hampshire. She later worked for Oglethorpe University in Atlanta. Citing a desire to return to California, she became a dean and professor at the Los Angeles Center of the Union Institute and University. She then spent nine years at Santa Barbara City College as dean of educational programs, where she oversaw 28 departments. In 2009, her journey up the leadership ladder took her to Oxnard College, where she served as executive vice president and oversaw academic affairs and student services, and worked as accreditation liaison officer. Several years later, LAVC tapped Endrijonas to become its president at a very critical time for the college. She rolled up her sleeves. Since 2014, Endrijonas has helped balance the budget and get LAVC back in good standing for its accreditation. During that time, she also has been an active and devoted promoter of business development in the San Fernando Valley, as vice chair of the Valley Economic Alliance and board member of the Valley Industry & Commerce Association. Beyond the impact Endrijonas has made as a leader for higher education and the Valley, she understands the great responsibility of leading and inspiring the LGBTQ community. Looking back at the college president’s own time as an undergraduate, Broesamle said he was fulfilling a moral obligation to one of his exceptional students. He identified early that she was going to be a difference maker. And he was right. Endrijonas said she appreciates the professor who pointed her forward.